Welcome to SoCal Pro Rider! We offer industry-leading advanced rider training and coaching to riders of all ages and abilities in and around the greater Los Angeles area. If you want to learn advanced riding techniques that will take your street riding up to exceptional levels, you are in the right place! Check out our FAQs for more info. We are adding content to our website all the time – our hope is through our mixture of articles, online tutorials and blog posts, you will learn some tools and techniques that will polish and improve your skills as a motorcyclist. For the ultimate in pro-riding skill and roadcraft development however, book one of our industry-leading advanced rider courses. Our goal is to take any rider, of any age and skill level and turn them into a Pro / Advanced Rider. What is Pro (Advanced) Riding? It is a deliberate, skillful and responsible riding technique admired by others. As an advanced rider, you are able to anticipate and control all situations to reduce your accident risk. An advanced rider is equipped with the expertise, knowledge and skills to ride safely and effectively in all conditions. What makes you different / unique? We are the only rider training school in SoCal that provides private motorcycle coaching (1:1 training) with courses conducted via radio, on California public roads and freeways. Don’t hesitate – book or call 310-562-6903 for more information today! motorcyclists that are already licensed and have their own motorcycle. 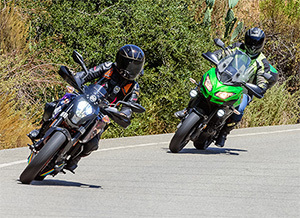 If you are just starting out and are looking to get your M1 license / motorcycle endorsement and the basic training that this endorsement requires, please visit the official California MSP site.